The Vegan Magpie: Love Seitan Cajun Offer! Hello! 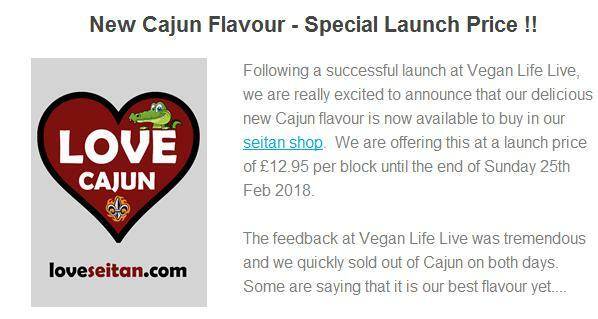 Popular (and delicious) Love Seitan have a new flavour...Cajun! What's more, they've knocked £2 off a block as a special offer until 25th February, making it £12.95 for 800g. Wahey! This is a new flavour which was very popular at Vegan Life Live. Love Seitan provide free shipping on orders over £20, otherwise it's £2.00. So bear this in mind when purchasing. Ms Cupcake end of season sale! Lidl veggie week 15th Feb! White Rabbit Skincare Valentine's offer! Moo Free Christmas chocolate sale!